Hi everyone! I will be starting a new series of posts, where I will discuss our upcoming HTML5 game, Gem Slide, and allow you to see what goes on behind the scenes in order to learn more about game development. While certainly anyone can benefit from the insight I offer, the tips in this series are targeted especially at people who don’t have much experience in developing games but want to make great titles. The keyword highlighting this post is innovation. First, I should address what I classify as such. An innovation doesn’t have to be big; but, simply changing one tiny detail in the gameplay doesn’t make a game innovative — the result is a plain clone. If a game has a core mechanic identical to Candy Crush Saga, contains all the same level types, but is just wrapped in different graphics and sounds, it’s a clone, not an innovative game. If, however, it introduces something unique in the gameplay as well, then we have a game that brings something new to the table. If you’re not familiar with match 3 games, most of them may seem like clones of each other. However, you should keep in mind an analogy: You can jump in every platform game, but not all platform games are copies of each other because of additional elements they introduce in the gameplay. If you’re interested in reading more about this topic, you can check out a post by Tracey Lien at Polygon. In the case of our newest title, Gem Slide, I decided that I wanted to make a match 3 game with gems. However, as there are plenty of such games out there on the market, including outright clones and rip-offs, I knew I had to do something to differentiate. To innovate, you will, obviously, first need an idea about a new feature. There are millions of different ways on how people can come up with ideas, but here is one method I like to use: You can think of the core mechanics of a game as a machine consisting of 10 parts. If you take one part out and replace it with another, how will the machine change? 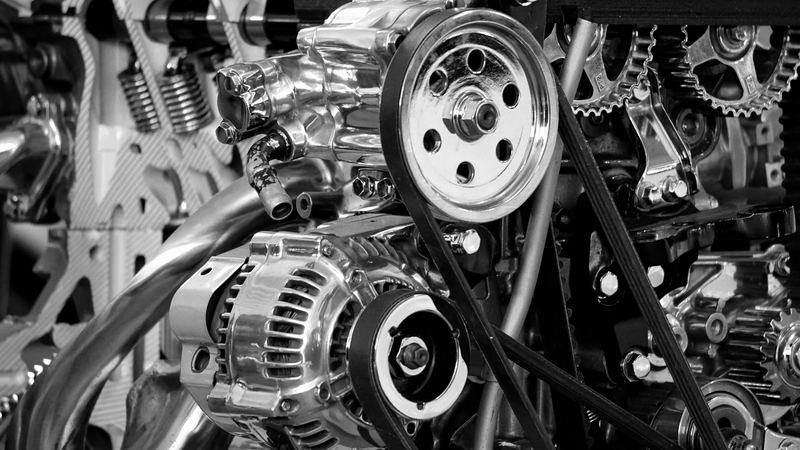 The core mechanics of the game are an intricately crafted machine. What would happen if you took out a part and replaced it? Would you have to adjust some of the other parts as well to make it fit? Does the grid have to be a square? What if it’s spherical? What else can a square contain than an object to be matched? What if a square in the grid contains 2 or more gems? How will the game be different if 2 or 4 objects need to be lined in order to make a match? Can matches be formed diagonally? What if the objects are not moved by swapping, but by sliding a row or a column? What if the move doesn’t have to result in a match? What if we could swap gems that are diagonally connected? How are the empty positions filled? Will the empty squares be filled with the gems that are above them or will new gems just appear on the spots that become empty? Is it possible to earn more time or moves as the level progresses? Are there other kinds of limitations than move or time limit? In the case of Gem Slide, the innovation lies in point 4: “What if the objects are not moved by swapping, but by sliding a row or a column? What if the move doesn’t have to result in a match?” These two rules are exactly what I have decided to use in Gem Slide. So, just by changing a single piece of the standard mechanic, it is possible to create some new gameplay ideas. However, the sliding mechanic presents another design problem to solve: What should we do with gems that slide off the grid borders? I decided to simply have these gems appear on the opposite side of the grid. This mechanic also makes it possible to make matches in a new way. For an illustration of this, see the pictures below. Sliding the middle row to the right will make the rightmost blue gem to be pushed off the grid, which is why it reappears on the left side of the grid. There’s also an important point I need to make of this choice: Namely, why did I choose to change this exact rule? When I was playing match 3 games such as Candy Crush Saga, I noticed that many levels are fairly luck-dependent: Sometimes you are able to get the gems at right positions to form good matches and sometimes not. Changing rule 4 allowed a lot more freedom in movement, which partly eliminates the luck factor: You don’t have to be lucky to get a gem at a right spot, as you can just move it there with 1 or 2 moves! 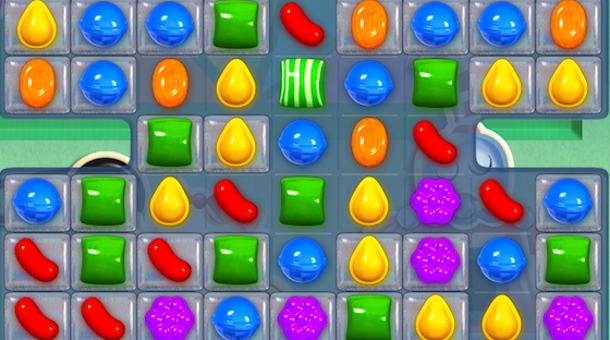 One of the main objectives in many levels of Candy Crush Saga is to make matches on jelly squares to clear them. However, at times, the player needs to have a little luck to get the right candies in the right places in order to be able to make these matches. Due to this, consequent tries of the same level may turn out to be very different from each other. However, it’s also important to keep in mind that whenever we take a part out of our machine and replace it, we have to make sure the new part fits the other old parts. In Gem Slide, changing rule number 4 meant that there were a lot more possible move options available to the player. The solution I came up with was limiting the grid size: In Gem Slide, the grids are a lot smaller than in many other match 3 games, which also limits the number of options available and makes it easier for the player to see all of them. As I also let go of the rule that requires the player to make a match with each move, smaller grids could be used without fearing that the player would run out of moves all the time. Smaller grids also served another purpose: They allowed the use of bigger squares. As the main focus of HTML5 games is being scalable and providing content for mobile devices, it is necessary that the game can be played nicely even with a smaller touch screen. Using bigger squares has helped in reducing missed taps. As I mentioned before, an innovation doesn’t have to be big: In the case of Gem Slide, the game innovates mainly in the gameplay mechanic, but many other areas in the game are similar to the majority of match 3 games of the same kind. Of course, there are games that innovate in various aspects, such as Jonathan Blow’s Braid (see the picture), which introduces unique ideas in gameplay, art, and music. For those unfamiliar with the game, I strongly suggest you check it out. Besides novel gameplay ideas, Braid features stunning, painting-like backgrounds and orchestral music — an atypical choice for a platform game. While creating something new is always more challenging than going down the old path of tried-and-true, it is definitely more satisfying in the end. 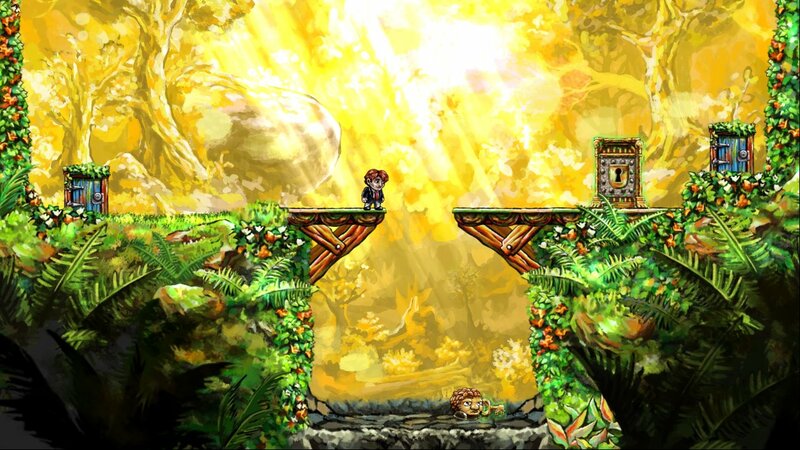 Besides, when a new idea is implemented well, that is how some truly great games have been born; such is the case with Braid. Also, if developers never tried anything new, the game industry would ultimately stagnate. This is why all indie developers striving to create new experiences receive my utmost respect. Well, that wraps it up for this time! In the next development blog post, I will discuss the small design decisions that had to be made during the development of Gem Slide.